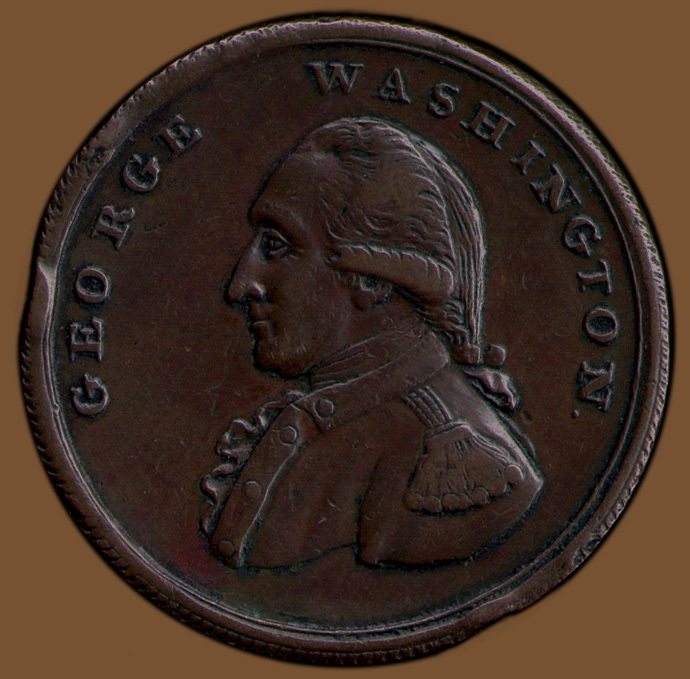 Comments: Listed as WA.1795.2 by Fuld and by Dalton and Hamer as, Middlesex, Penny section, Washington Series, no. 243. 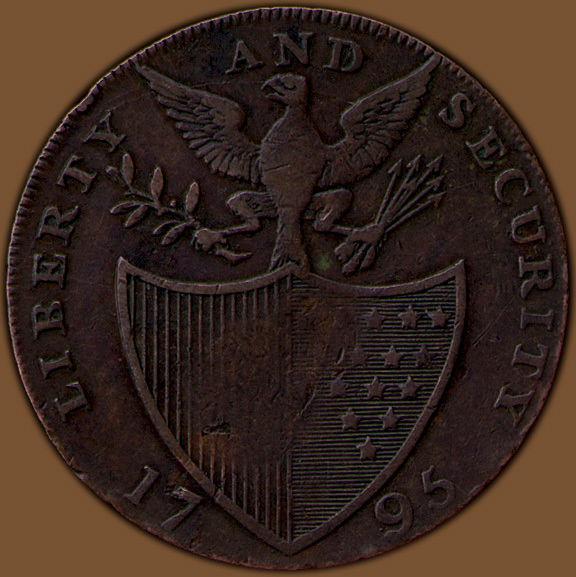 This example was removed from a PCGS slab (767.50/4746226) where it was graded as AU50. There are several rim dings present. 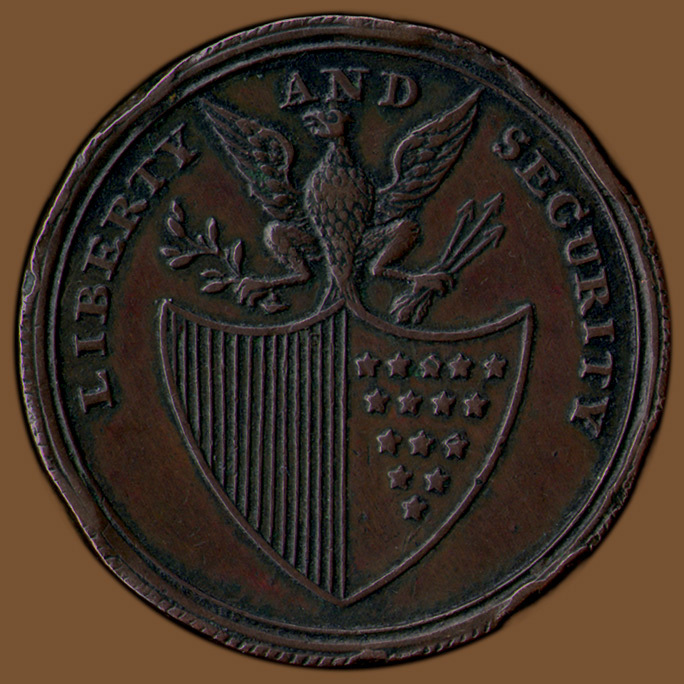 As stated in the introduction this larger size token was designed by Thomas Wyon and struck by Peter Kempson in Birmingham by 1795. 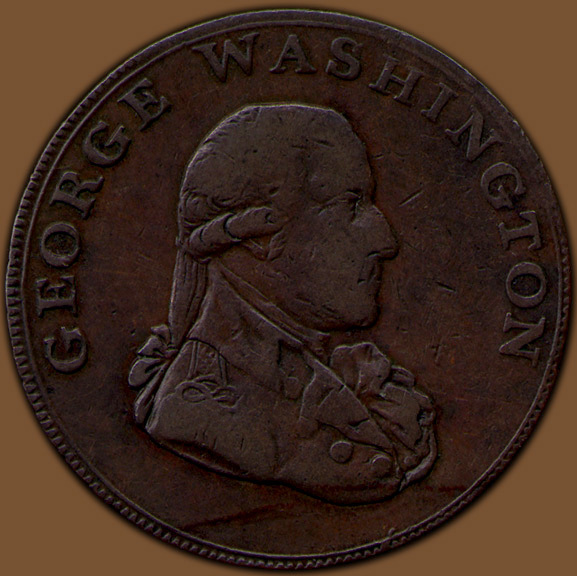 It predates the "halfcent," which was modeled on this piece. There are several small die cracks present. 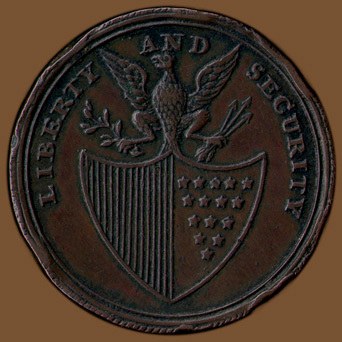 Most notably on the obverse there is a small line on the inside of the bottom curve of the S in WASHINGTON and on the reverse there are two small dots at the upper left corner of the shield. Provenance: Acquired through the Robert H. Gore, Jr. Numismatic Endowment from EAHA auction of January 17, 1998, lot 91. Comments: Listed as WA.1795.1b by Fuld and by Dalton and Hamer as, Middlesex, Political and Social Series, no. 1052. 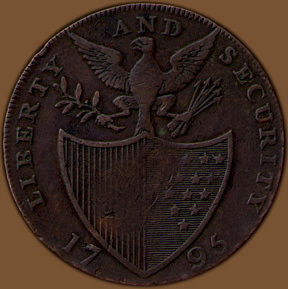 There is an extensive die crack on the reverse extending from the rim above the Y in LIBERTY continuing through the eagle's wings and head and through the letters ECU in SECURITY and ending at the rim above the letter R. There is also a planchet void in the lower right portion of the shield. On the lettered edge following the legend are the planetary symbols for the Sun, Mercury, Saturn, Moon, Venus, Jupiter and Mars, but on this example the edge is thin at that point and none are present. Fuld estimates 35-40 specimens are known. Provenance: Acquired through the Robert H. Gore, Jr. Numismatic Endowment from EANA auction of November 16, 1996, lot 106.